Getting the perfect dog harness is challenging, even if you know for sure that a dog harness is the best option for your puppy. There are a lot of choices out there when it comes to the best dog harness, starting from where you clip your leash to what size you need for your dog. This buying guide will cover both the huge number of factors to consider when you’re buying a dog harness as well as give you some suggestions on the best dog harnesses out there. You should be able to find the perfect harness if you follow the information included with this guide. Let’s look at five of the best dog harnesses on the market right now. Not all of these will be perfect for your dog, but at least one or two of them should, and they are top quality harnesses from some of the best brands in the business. Choosing anyone of these five harnesses will be a terrific buying decision. The first harness on the list is this extremely stylish and comfortable one from EXPAWLORER. This harness comes in several different colors and five different sizes, so you are sure to find the perfect one for your dog. The first terrific feature of this harness is the material that it is made from. This is an extremely durable harness made of scratch-resistant Oxford material as the outer layer and features a lightweight buckle with a large load capacity which means that it is going to last you for many years to come. Plus, the material is soft and slides on easily, making it a snap to slip on and off your dog. There are also a number of safety features included with this harness. The nylon webbing material includes 3M reflective tape so that your dog can be seen at night easily, as well as a sturdy handle so that you can attach a seatbelt if you take your pet in your car with you. It is also really comfortable on your pet with sponge padding on the chest and belly to prevent chafing and there are two different attachment points for your leash including the V-ring on the back and another directly at the center of your dog’s chest. So many harnesses out there are often one or the other when it comes to comfort and durability. It is pretty rare to find a harness that is both extremely comfortable for your dog, but made up of materials that are going to last. After you measure your dog’s girth and figure out exactly what size harness you need, you can choose from between extra-small, small, medium, large and extra-large. The harness also comes in black, green and orange. Black may be the most stylish, but oranges definitely the easiest to see; so you will have to choose which color you prefer. 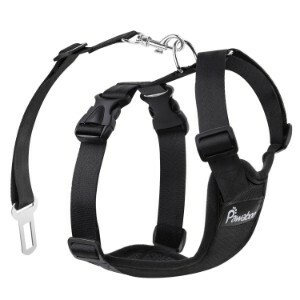 Next, the Pawaboo dog safety harness is the next harness on the list, and this one definitely has a few advantages even among the cream of the crop listings here in this guide. The first thing that you need to know about this harness is that it comes in four different sizes including small, medium, large and extra-large. That gives you a great deal of freedom when it comes to different breeds and can work with Labrador Retrievers, German Shepherds, Golden Retrievers, French Bulldogs, Beagles, Rottweilers and more. Just like getting a dog crate or dog bed, you have to make sure that the sizes that are available will fit your dog, and these sizes definitely do the trick. When you choose the right size harness, you are able to ensure the maximum comfort of your dog while wearing it. But there are other advantages that this dog harness offers as well. For example, this harness features a safety strap with a seatbelt end attached so that you can keep your dog secured with a seatbelt while you are driving. This ensures that you are able to drive safely because your dog cannot climb over the front seats and try to get in your lap or distract you at the wrong moment. This is also really well constructed safety harness, featuring a premium stainless steel snap hook and 100 percent polyester Oxford fabric. It is lightweight and soft, and you can easily slip it on and off. Wide sponge padding is added at the chest plate and other contact points to provide your dog with the maximum amount of comfort as well. This harness vest can be used indoors or outdoors, while riding in a car, while in a dog playpen, outdoor dog kennel or even in the dog house. It works seamlessly with a dog collar and is unobtrusive enough to even be part of a dog costume if necessary. 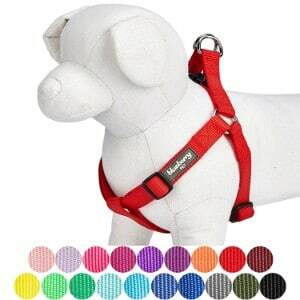 From Expawlorer, this soft, reflective harness is terrific for all kinds of breeds including Bulldogs, Poodles, Yorkshire Terriers and Pointers. Getting the right harness is important, especially if you are going to be combining it with additional accessories like a dog seat belt or dog car seat cover. These dog harness reviews contain the best of the best, and this one demonstrates exactly why. There are several sizes available and nearly a dozen different colors to choose from. But this particular no pull-harness is made to work in a vehicle. It improves driver safety by reducing the chance that a pet will distract them with a comfortable harness that can work with restraints. 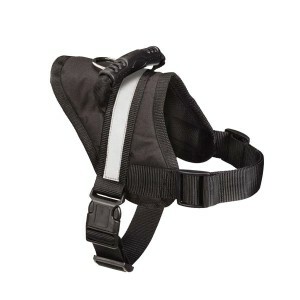 This harness is constructed of high-quality fabric, and it is durable and lightweight, as well as soft. The thick padding on the underside where the harness is in contact with your dog’s skin will make it really comfortable to wear, and it features a heavy-duty D-ring where you can attach your leash. It also has a reflective strap to make sure that drivers can see your dog at night. There are three different sizes that you can choose from, including small, medium and large, and they should be sufficient for most of the breeds except for the very small ones. There are also several different colors to choose from, and this is one of the most attractive harnesses on the market. There is also a really handy and sturdy handle on the back that allows you to carry the harness around when you are not using on your dog, or when you need to take control of your dog if they are trying to run away or encounter another dog that they do not like. Plus, this handle will help you to get them into the car better. The bottom line is that this is just a really well-designed harness made out of sturdy materials and still looks great to boot. Blueberry makes a really great harness that is featured here. Blueberry dog harnesses are some of the best harnesses on the market, with this brand gaining recognition from veterinarians, dog breeders and all kinds of experts all across the country. One of the things that make this such a great harness, even among the top ones on this list, is just how many options are available for customization. If you are going to get a dog harness, then you might as well make it your own and fit it to you and your dog’s unique style. With colors like royal blue, dark orchid, Florence orange, medium turquoise, neon green, emerald and French pink, there are plenty of choices to choose from. There are also three different sizes that you can get including the 16.5 to 21.5 inch chest girth which is considered the small, the medium which is 20 inches to 26 inches or the large which is 26 inches to 39 inches. 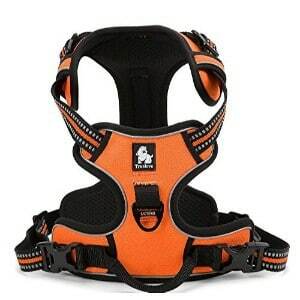 However, there is a lot more that makes this one of the most sought after dog harnesses on the market. The material is soft and durable, with brightly colored nylon in whichever style you choose, with heavy-duty buckles and D-ring fasteners to attach your leash. It is made to last for a very long time, as well as made to be comfortable on your dog. You do want to fit these carefully, because they do not stretch so you don’t want to leave your dog unattended very long while they are in the harness. Another thing that is great about blueberry is that they sell all sorts of accessories, and they make sure to offer matching sets for those that want them. For example, with any of the colors that are offered here, you can also get a matching dog collar and a matching dog leash. Of course, you can always combine your own dog accessories by finding the same color including indestructible dog beds, cooling vests for dogs, a dog bowl or automatic dog feeder or various other accessories. URPOWER is a well-known brand when it comes to dog products, and it is definitely one of the top brands when it comes to harnesses. There is a lot you can do to make sure that your dog gets the activity that he or she needs. You can use a GPS tracker for dogs or dog activity monitors to measure their movement, but taking them for a walk is one of the best bonding experiences that you can have with your dog. Plus, it is one of the best ways for both of you to get exercise. Making sure that you get one of the best puppy harnesses will allow you to take your dog for walks without having to worry about the rigors of collars, and give you better control over your dog. This dog harness from URPOWER is definitely one of the best out there, and there are several reasons why. One reason is that it has extremely heavy-duty construction. These harnesses are made from a combination of denim and thick nylon, providing for a dog collar that is almost indestructible. It gives you comfort and control all at the same time, and there is even orange nylon stitching that adds to the total overall strength. But these harnesses are not just strong; they are also comfortable for your pet. The material is soft and they are sized perfectly as to distribute weight evenly. They also come with extremely strong hardware that is going to stand the test of time. Some of the other features of this harness are that it reduces chafing because the straps are all soft textures with no hard edges and the buckles are located on the outside so that they do not irritate your dog’s skin. They also do not lie on sensitive areas of your dog’s body like the armpits, and the design is so advanced that your dog will not want to pull very much on it anyway. They are also extremely stylish with orange stitching and vibrant blue dyes that make for a really excellent harness for any dog. In order to choose the best dog harness, you are going to want to know all of the different factors that go into choosing a dog harness. There are a lot of things that you want to keep in mind, so we have come up with this buying guide that will help you with what you need to know before getting the perfect dog harness. A dog harness is like a dog collar, your dog is going to be wearing at most of the time whenever you go out for walks or they are in your car. Many dogs were harnesses full time. Making sure that you choose the best one is important. We will be covering a great deal of information in this buying guide including whether you should choose front-clip or back-clip harnesses, and what the advantages and disadvantages of each are, how to size your dog for a harness and how to choose the size that will perfectly fit your dog, the various types of harnesses that are out there, the styles that are available and a whole lot of other information that all should be taken into consideration when choosing a dog harness. However, let’s start with understanding why you would need a dog harness in the first place. There are lots of reasons to get a good dog harness, but there are some pretty specific ones that let you know that you actually need a harness. Many people can go through life with only using a collar on their dog. Others struggle with the collar, and may need to switch to a different method. A dog harness offers a safe and effective method for training, controlling walks or making sure that they are secure in a vehicle. Harnesses are also safe when it comes to chaining up your dog. There is far less chance of your dog choking when they are wearing a harness. But there are lots of other reasons that you should consider getting a harness for your dog. Dogs that pull on their lease run the risk of straining or spraining their neck and even causing permanent damage. A harness is a much better idea than a dog leash, because it redistributes the force around the body instead of all being at the neck. For dogs that are difficult to control, a harness can be a much better solution. A dog harness is also a lot less likely to break or slip off. When you have a collar on your dog, it is possible that he or she will be able to wriggle out of it with a little work. But it is much harder to get yourself out of a harness. Most of the time, a dog harness is much preferred over a collar. You will have to make a decision as to whether to go with a front-clip harness or a back-clip harness. Harnesses generally have a clip in one of two places. The harness clip may be on the front right in front of the dog’s chest, or it may be on the back. Either one is fine when it comes to training and getting your dog to behave. It is simply a matter of personal preference. However, there are some things to keep in mind about each of these clip types. Back-clip harnesses are best for small dogs or dogs that have any sort of respiratory problems or neck injuries. They are also best for older dogs that may have difficulty breathing if their airway were restricted. You want to avoid putting back-clip harnesses on dogs that pull a lot or large dogs that have a lot of strength. Front-clip harnesses are best for dogs that pull on their leash a lot, or dogs that jump or get distracted or try to run up to other dogs when they see them. Most of the time, front-clip harnesses are best for larger dogs too. However, you don’t want to use front-clip harnesses for dogs that have major behavior problems or have a great deal of aggressiveness. The front-clip harness has less control than the back-clip harness. There are four main types of harnesses that we will be covering here. Each of these harnesses is a little different, so you will need to determine which one you want to use for your dog. Each of them has their own advantages and disadvantages as well. Let’s take a close look at each of the four types of harnesses so that you can decide which one to get. The more research you are able to do on a specific type of harness or a specific problem you’re trying to solve, the more successful you will be at getting your dog the right one. Tightening Harness: A tightening harness is not the most comfortable dog harness, but it can offer you some other benefits; for example, a tightening harness can give you more control over an unruly dog because it tightens up when you pull on it; it isn’t painful for your dog, but it does apply pressure around the body which can cause them to pay attention. Tightening harnesses are best for dogs that pull stubbornly, dogs that jump or any dog that you cannot control with a normal harness. However, you want to avoid using a tightening harness with dogs that are timid or have been abused. Also, dogs that do not respond very well to corrective training are not going to do well with the tightening harness. The pressure of a tightening harness is minimal, but abused dogs that are used to receiving poor treatment may act out. Head Harness: A head harness is a type of dog harness that works in very much the same way as a dog collar does. Basically, you control the dog by controlling his or her head. The head harness doesn’t fit around the body like an ordinary harness; instead it fits around the dog’s muzzle and the entire head. This gives you a lot more control, but it does cause a little bit of discomfort as well. 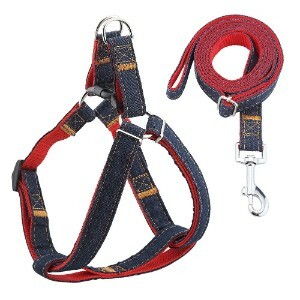 This type of harness is best for dogs that have had training and respond well to being guided with a leash. You don’t want to fight with your dog when you have this type of harness on. However, light pulls in the right direction are perfectly fine. These types of harnesses are also best for dogs that get distracted easily. Avoid using this harness if you get frustrated with your dog or if they have a particularly short muzzle. Mobility Harness: The mobility harness is a type of harness that provides a great deal of mobility. It is also known as a dog sling harness. This type of harness is made to fit dogs that have limited mobility. For example, if your dog is older or has some sort of disability that restricts the movement, then this might be the perfect solution. These types of harnesses feature things like a hip lift handle, a back candle, wraparound handles or more. They are all intended for one specific purpose: for you to be able to help your dog when they are not able to get where they are going by themselves. For example, if you are trying to get your dog into your car and they have limited mobility, lifting them up by the back handle might give them the boost that they need. Vest Harness: You might also want to go with the vest harness. A vest harness is basically just like most of the other harnesses listed here except that it covers your dog’s body instead of having straps. Vest harnesses are great because they can either be heated or cooled depending upon the temperature, and they can reassure dogs that have a great deal of anxiety by providing a sort of hug that goes with them everywhere. Not every dog will take to this, but many of them will. Fitting your dog harness is important. When you’re looking for the best dog harness for large dogs or the best dog harness for small dogs, it is not one-size-fits-all. You need to be able to fit your dog harness to your dog, and that means sizing it correctly. But how do you do this? The good news is, with most of the harnesses that are on the market right now, you will be able to find the measurements right there with the size. They will tell you exactly which measurements work best with which size so you don’t have to just get a large or small and guess at what would fit your dog. You can actually take the measurements and then get the size that corresponds to them. But it all starts with getting the right measurements. For that you are going to need some sort of measuring tape. The best ones to get our the soft weight loss tapes, which usually come in 60 inch length, so that you can wrap them around your dog and see exactly what their girth is. The girth is the main thing that a dog harness sized on. When you measure the girth, you will be able to determine which size to buy for that dog. That’s not only because it is the widest part of your dog, but it is also because it corresponds evenly with all the other areas the dog collar fits. This varies slightly from one breed to another, but the general rule is pretty solid. If you take a look at the reviews listed above, you will notice that most of them have sizes listed, and with each size is a minimum and maximum chest girth. That is what you measure on your dog and then you purchase the corresponding size. If your dog is close, then it is up to you whether you choose one or the other. For example, if the medium size is 21 to 35 inches, and the large size is 35 to 44 inches, you can choose either one of these if your dog is 35 inches. However, they will probably be happier with the looser harness. One thing that you do want to keep in mind though is that some harnesses will fit pets differently. The way that a harness fits will be dependent upon your dog’s build, weight and various other factors. Roman harnesses may fit much differently than vest type harnesses. If you get the wrong one, make sure that you can return it for the proper size. You will have to determine the strength of your dog harness and how durable it will be based upon the material in the construction. There are two major factors that determine strength and durability. The first is the material, and the second is the ply of the material. You will have to look at each of these factors in detail to determine exactly how long your dog harness is going to last and whether your dog will be able to bite it and chew through it or hold them if they start to launch. Let’s take a look at each of these. The material you choose is important. Nylon is the most common materials the dog harnesses are made out of. Most nylon is pretty strong no matter what. In addition, nylon is pretty standard among all dog harnesses. So if you are choosing between dog collars that are made of nylon, then you don’t have to worry about the material that much. However, if there is another material used in the construction then you may want to consider the durability of that material. The ply of the material is also important. Generally, dog harnesses are either one-ply or two-ply. You have probably heard the term applied to toilet paper before, and the principal is the same. One-ply dog harnesses have one layer of material while two-ply harnesses have two layers. Obviously, the dog harnesses with two-ply materials are going to be stronger than the one-ply. The material that the best harnesses for dogs are made out of is also important. There are number of materials that can go into making dog harnesses, but the two most common ones are nylon and leather. Nylon is definitely the biggest material used in the construction of dog harnesses, mainly because it is cheaper than leather and offers many of the same benefits, but some people prefer leather harnesses especially when they are showing off their dog or have a little extra money to spend. Of course, like anything else, there are advantages and disadvantages to both let’s take a look at each of them in detail. Nylon dog harnesses are more inexpensive than leather dog harnesses. Plus, nylon dog harnesses can come in just about any color you can imagine. When you buy a nylon dog harness, especially when you buy online, you may have up to a dozen different colors offered – and sometimes many more. Sometimes, the color combinations can even be two-toned instead of a single shade. Nylon harnesses are also extremely strong and will stand up to a great deal of pulling by your dog, and they will also not suffer from the wear and tear of some of the weaker materials out there. However, nylon dog harnesses do not look as good as some of the other materials. That’s where leather comes in. Leather is one of the dog harness materials out there that look the best. When you have a leather dog harness on your dog, you can take him anywhere and people will be impressed. Often, owners use leather dog harnesses when they are taking their dogs to a dog show. Leather harnesses can come in a few different shades, and they are as strong as nylon in many cases. However, leather does not stand up to wear and tear quite as well and they certainly do not stand up to the elements like nylon does. It should go without saying that leather dog harnesses are also quite a bit more expensive. Let’s take a look at some of the various features of dog harnesses that you need to keep in mind as you are shopping for one. These features may not be available on every harness, but you should determine which ones are the most important for you and then narrow down your choices to choose the perfect dog harnesses. Reflective tape can be a really smart addition on dog harnesses because they allow your dog to be seen at night when you’re out walking. If you tend to go out walking when it is dark outside, reflective tape on a harness can ensure that other cars see your dog as you are walking down the sidewalk, and especially, see your dog in time to put on the brakes if your dog runs out into the middle of the road. Smart technology has made dog harnesses much more useful than they were a few years ago. You can put all sorts of smart technology in dog harnesses including GPS tracking, temperature monitoring, activity monitoring and various other smart technologies. Normally, you control this with your smartphone and you are able to determine exactly what is going on in your dog’s life by monitoring these things. Smart technology is more expensive than standard harnesses – often by a lot – but if you are concerned about your dog and you want to get information sent directly to your smartphone, then you definitely want to consider smart technology in your dog’s harness. Waterproofing is always a good idea when it comes to dog harnesses. Not every dog likes to jump into a body of water whenever they see it, but many do. Plus, when you decide to shampoo your dog’s fur with dog shampoo, having a dog harness that is waterproof will give you a great deal more control because you were able to hold onto them while you are giving them their bath; most of the time, nylon dog harnesses are completely waterproof and will dry out in the sun. Leather dog harnesses are not as resilient against water. You want to look for that information in the product listing when you buy your harness. Style and color may not be as important as some of the other factors listed here, but there still something that you should consider. There is no reason to get a dog harness for your dog that you are not going to like. Your dog will probably be happy with whatever you choose, but if you are going to purchase one with your own unique style in mind, then you want to get something attractive. In addition, if you want to go with the matching leash and collar, then there are certain brands that you want to go with that offer these options. Blueberry is a really good brand when it comes to matching up different accessories like leashes, collars and harnesses. Finally, price is always a consideration when it comes to purchasing anything for your pet. However, you don’t want to worry about price is much as you do some of the other factors that are listed here. For example, if you have to spend more for a dog harness that is going to be a great deal more durable, and you know it is going to fit your dog, then you should be willing to spend that money because it will last you for many years to come and you won’t have to replace it. Getting a cheap harness on the other hand will require that you replace it fairly quickly and you will actually end up spending more. The bottom line is that there are plenty of factors to consider when it comes to buying a dog harness for your dog. You want to choose the right type of harness for the behavior or the problem that you are trying to correct, you want to choose the right material for the harness, and you want to make sure that you get one that fits your dog perfectly. Dog harnesses can be extremely useful for certain types of behavior or to control dogs that are overly aggressive or friendly. However, you have to know what kind of dog harness to get in order to curb that behavior, because not all dog harnesses will serve the same purpose. This handy guide should give you some important information that helps you choose the perfect dog harness for your dog.